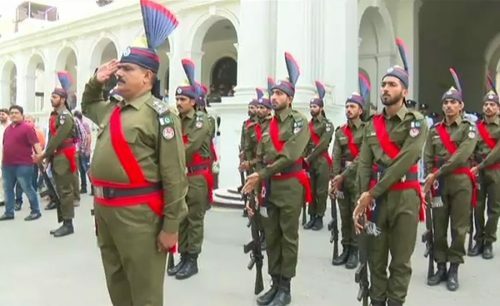 LAHORE (92 News) – Inspector General of Police (IGP) Amjad Javed Saleemi has been removed from his post on Monday. In this regard an official notification has been issued by the Punjab government. The notification stated that Arif Nawaz Khan has been appointed new IGP in place of Javed Saleemi. 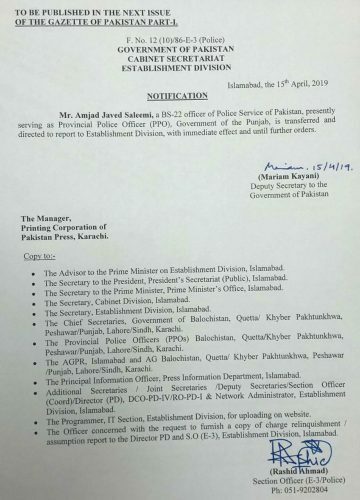 According to the notification, Mr Amjad Javed Saleemi, a BS-22 officer of Police Service of Pakistan, presently serving as Provincial Police Officer (PPO) government of Punjab, is transferred and directed to report to Establishment Division with immediate effect and until further order. 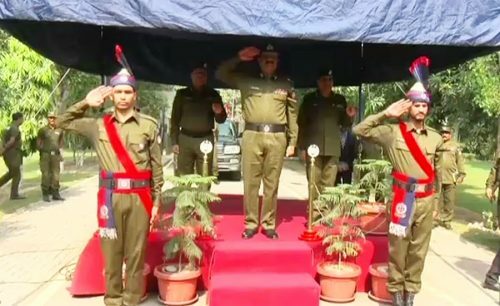 Meanwhile, Captain (retd) Arif Nawaz Khan, a BS-22 officer of Police Service of Pakistan, presently serving as Secretary Narcotics Control Division, is transferred and posted as Punjab Police Chief. Earlier, replacing Tahir Khan as Amjad Javed Saleemi took charge as Punjab Inspector General of Police (IGP). Upon arriving at office, Saleemi was presented a guard of honour and was warmly received. Speaking to the journalists, the new IGP announced to make the accountability unit for taking police reforms and giving relief to the citizens. He assured that if the complaints proved fair against the personnel than the action would be implemented. Saleemi vowed to make sure for registering the first information report (FIR). He also said that there are a lot of issues facing Punjab and not enough personnel. “We will draft policies in keeping with the needs of the citizens and number of policemen available,” he added. Saleemi assured that reforms will be introduced and citizens will be facilitated. Saleemi took charge as IGP a day after the by-polls concluded and the federal government’s decision regarding appointment of the police chief went in effect.Last week, the Election Commission of Pakistan (ECP) had suspended the federal government’s decision to replace Punjab police chief Tahir Khan with Saleemi stating that the police chief replacement would be considered a violation of the ECP rules due to the by-polls. The Establishment Division had issued a notification to appoint Saleemi as the Punjab Inspector General of Police (IGP). Amjad Javed Saleemi was appointed IGP Punjab on October 9, 2018. He earlier served as Sindh police’s chief. Saleemi joined the civil services on November 1, 1986. He was previously a grade 22 officer of Police Service of Pakistan, serving as IG National Highways and Motorway Police (NH&MP). He is due to retire on January 31, 2020.